They say that wine goes straight to your head. Well we take that quite literally here at DesignForYourWine.com. 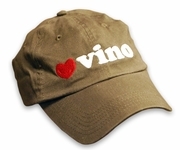 We carry a few great wine lover hats and caps for you or the other shameless "wine-o" in your life to put on. Nothing says �yes I�d love a glass of Cabernet� quite like a wine lover hat. 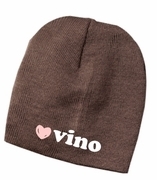 We sell skull caps or baseball caps with the phrase Love Vino on the front. You can get a hat with a pink heart for the ladies, bold red for the lovers or your own favorite shade.Choose your desired text color and hat color mix to make it all your own. You wouldn't settle for a low grade wine so be sure to get the best when it comes to wine hats, caps and other apparel. Design For Your Wine is a head above the rest when it comes to selling top quality wine gifts. You'll always find the highest quality Wine Lover Hats & Caps when you shop at TShirtHub.com.